Discussion in 'Latest US & World News' started by Destroyer of illusions, Oct 29, 2016. Russia has unveiled chilling pictures of its largest ever nuclear missile, capable of destroying an area the size of France. The RS-28 Sarmat missile, dubbed Satan 2 by Nato, has a top speed of 4.3 miles (7km) per second and has been designed to outfox anti-missile shield systems. 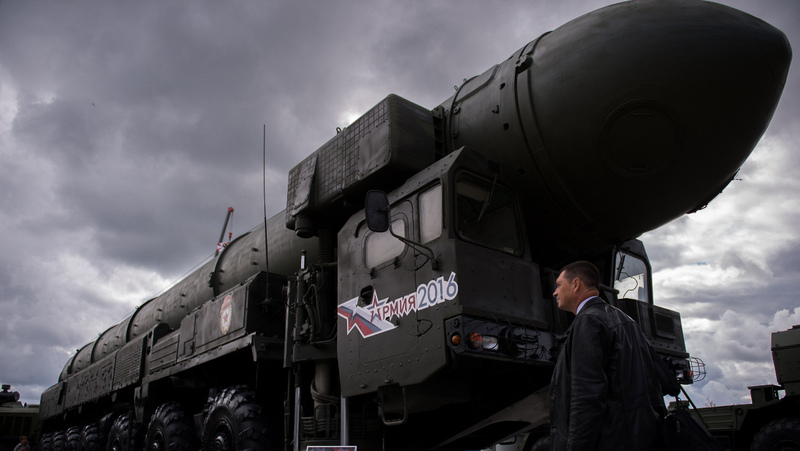 The new Sarmat missile could deliver warheads of 40 megatons - 2,000 times as powerful as the atom bombs dropped on Hiroshima and Nagasaki in 1945. The RS-28 Sarmat missile is said to contain 16 nuclear warheads and is capable of destroying an area the size of France or Texas, according to Russian news network Zvezda, which is owned by Russia's ministry of defence. The weapon is also able to evade radar. It is expected to have a range of 6,213 miles (10,000 km), which would allow Moscow to attack London and other European cities as well as reaching cities on America's west and east coasts. The US military the expert said - An explosion so powerful warhead over Manhattan kills 7.63 million people and 4.19 million wounded. I think that the wounded - it's the same thing that killed. After such an explosion. The living will envy the dead. Is not it? Successful missile. I hope that the feeble-minded and aggressive Western politicians hear military experts. I understand that Western politicians do not care about their people. But I hope for their survival instinct. You think so because the Russian want to protect themselves? What's this about the 50th time this mongol dwarf has "warned", USA,lol, reminds me of some old timer warning a 20 something yr old that my balls are as big as yours!! Who has attacked Russia or threatened them? I don't think any of those Satan babies are likely to be launched at the US if "Peacemaker" Don becomes Pres.. But if "Armageddon" Hillary gets in and keeps throwing hissy's at Vlad it could be a different story.. I usually enjoy your posts... not this one. You enjoy watching westerners suffer? Trouble is Satan is the name that NATO gave to the Russian R-36 series of missiles, not the Russians. But Satan is far more menacing than R-36, and after all the US uses such feel good names as Titan, Minuteman and Peacekeeper for their continent destroying missiles. "If you go on with this nuclear arms race, all you are going to do is make the rubble bounce"
You are not right. If I loved suffering Westerners, I would support Obama and Clinton. I try to open the eyes of the Americans. Show that the true enemy of the American people is sitting in the White House and the Pentagon. Let's face it. Really this Russian sending Americans to die and to kill people in Iraq, Afghanistan, Libya, Syria, etc.? Really this Russian bring his army to the borders of the United States? Really this Russian killed the real sector of the US economy?....And so on. The American people need to wake up and face the truth. Conservatives with their paranoid and/or money-making ways, never discuss American counter-measures that would easily destroy Russia. They wouldn't be able to fear-monger their way into taxpayer's wallets, supporting our long-absurd military budget. So let's double our military budget once again, so that (1) paranoid Republicans can sleep better at night and (2) those who are morally-challenged and invested in the Military Industrial Complex can make even more money. Yeah Margot maybe he is. I would be careful not to annoy him too much if I was the US or Europe. I mean you never know! Hee, hee, hee! There goes France! Maybe you should start reading the news. Oh that's right, you only read the MSM propaganda sheets. You can find reliable accounts of what's going on in the internet. For a starter though take a look at a map. Notice that it's not Russia surrounding us with bases, nor has Russia planted NGO's for regime changes in countries friendly to us..
Russia doesn't have anything to fear. First off the Neo libs are just mouth and only talk a good game due to their trembling fear of violence. Of course, now the Neo Cons are full of bluster until things get real. Then they fall back off into their roots of being a Lib. Naturally the illiberals don't know much of anything and have to be told what to do and say. 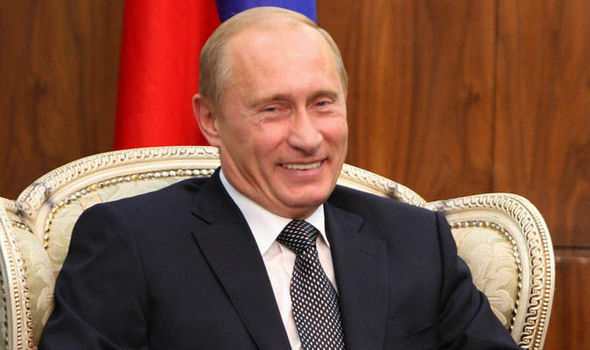 Besides Putin knows they would rather use NGO's to try and subvert a people. Throw out some fake promises. Talk about it takes a village, the war on women, and divide a nation of people up into labels. You are wrong. Dangerously wrong. How so....Putin don't fear any Democrats, and he knows they are all mouth and no spine. I have entire thread showing how it is so. He'll look taller when everything around him is flattened. Give me the link.....you know how the leftness likes to bury over bad news for their Team. I have one up to....with Putin upping the game. No one in the west has ever or ever will threaten to do what you seem to be threatening. Your paranoia is a very dangerous thing and has led to the protection measures that you complain about from NATO countries. Oh....and your little "Satan" missile basically means you folks get an hour or so head start before your country goes bye bye. Most people are bright enough to know this....it is a pity that you do not.